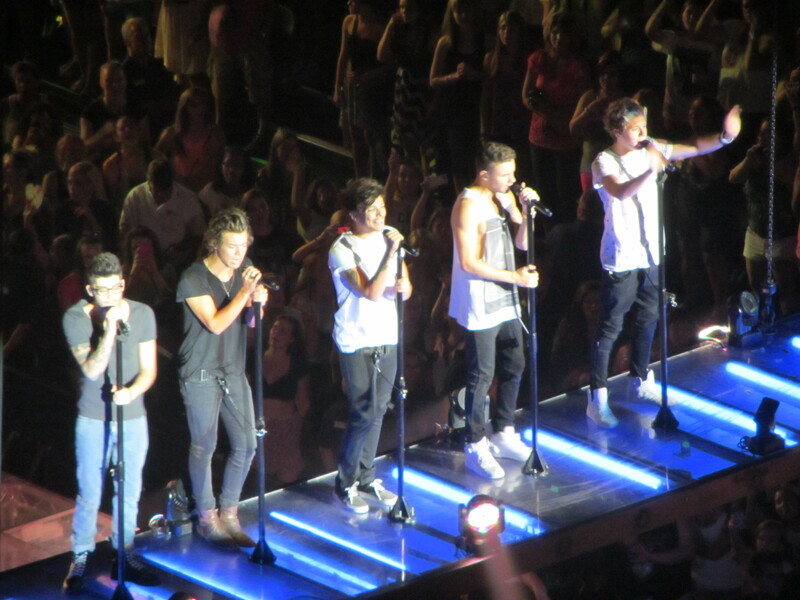 I haven’t done much writing in a while (well that’s not true, Fever Pitch is coming along, just slowly lol) but I have a good excuse for the past few days at least – One Direction’s concert in MN. OH EM GEE. Yes this going to be a very self-indulgent post but I don’t care! I went to the show with my friend Katie, and we literally planned this over a year ago so it’s crazy to think that it’s come and gone already! We bought the tickets a few weeks after the show was announced (on StubHub, obvs, since the show was completely sold out) and we’d text each other every so often with a “one year until the concert!” “six months until the concert!” until FINALLY the concert was here! I won’t bore you with the details of the rest of my trip (which included two 7 hour drives from Winnipeg and back with my boyfriend who was nice enough to accompany me on this crazy boyband adventure as well as Mall of America and a fantastic day of boating and tubing on the St. Croix river) but on Thursday night, Katie and I were PUMPED. We’re total dorks and dressed like the guys at the concert – Katie in a varsity Jacket for Zayn and me in a red polo and tan pants for Nialler. Ha! It was a super fun car ride of listening to 1D on the way and discussing fanfic lol. The Target Center is massive. I’d never actually been there before (which is funny, since In Pieces is set in between there and the Crowne Plaza which I stayed at) but it was quite a typical arena. We bought some merch (read: I bought out the merch stand with two t-shirts, a program and a hoodie) and headed to our seats. We were in section 205, so we were on the upper deck towards the back, but a little off the the right so we saw the stage at a weird diagonal angle. It was good though because we were close to the platform they were on during the middle part of the show. There were some cool people around us, including a woman with a 1D shirt that said “#1 Directioner Mom” on it LOL. The girls beside me were adorable and seemed like they were having a lot of fun. No one in front of me had a huge sign this time, YAY! We sat down during 5SOS’s set, and while they weren’t bad I’m not super into them. They did a few of their own songs and they also did a cover of Teenage Dream. After that the screens played all sorts of ads for 1D (like their fragrance, their Claire’s line, their Office Depot line, their Oreos… basically every company in the world who sponsors them) as well as some Little Mix stuff and Olly Murs stuff. It’s definitely clear who their associated acts are. Eventually the ads stopped and the lights went down and all of the twelve year olds screamed (okay fine, we did too) There was a video that played of the boys at a house party that was hilarious, and then they burst on the stage and sang Up All Night. After that they did their little intro and said ‘Minneapolis’ about 30 times just to get the crowd to sing. They sang a few more songs and honestly, they were so much more energetic than the last time I saw them. That’s saying a lot because I thought they were amazing on the Up All Night tour, but it’s clear they’ve become a lot more comfortable on the stage and even around each other. They eventually came up on this big platform thing and sang Change My Mind, before being dropped off on this mini-stage in the middle of the floor. That was a lot closer to us, so I was able to get some good pictures. Then they were questioning Zayn about his “spectacles” (well, Niall was) since he wore glasses for the entire show. And once Niall started questioning him the rest of them crowded around him as well. It was quite funny. They sang One Way or Another on the platform and Teenage Kicks, then they went back up on the platform and back to the main stage. They did a few more songs, including Over Again which had Niall and Louis sitting off to the side of the stage where Niall played guitar. They also did Little Things, which was lovely with all the phones in the air. They shows a video which featured the boys dressed in disguises going around and tricking people, Louis in a fatsuit giving out free hugs was especially hilarious. No one knew it was him until he revealed it to a little girl at the end of the video. 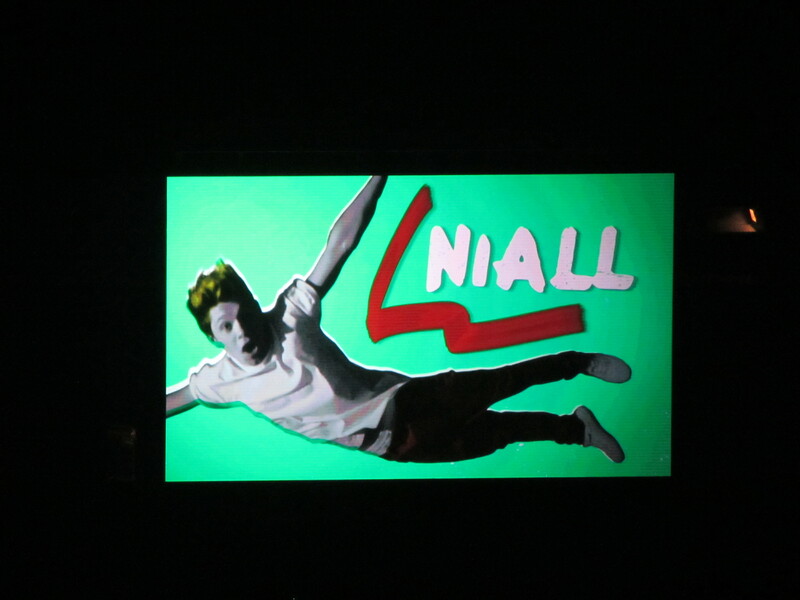 They sang Teenage Dirtbag, which had this cool comic book background featuring the lyrics and the boys all animated. Then they did Rock Me, which I completely fangirled over because it’s my favourite song. It was the only song I recorded. They were pointing out their favourite signs in the crowd and Liam seemed really “offended” by one saying “That one’s just rude! It’s just rude!” LOL. Aw Liam. There was also this really cool screen in the middle of the stage that at one point was broken up into five parts and had each boy on one of the parts. But they move around the stage so much so it was difficult for them to stay on one screen each haha. Towards the end for the encore, Niall came out wearing his sunglasses, and Louis was making fun of him for it, so that was pretty funny. 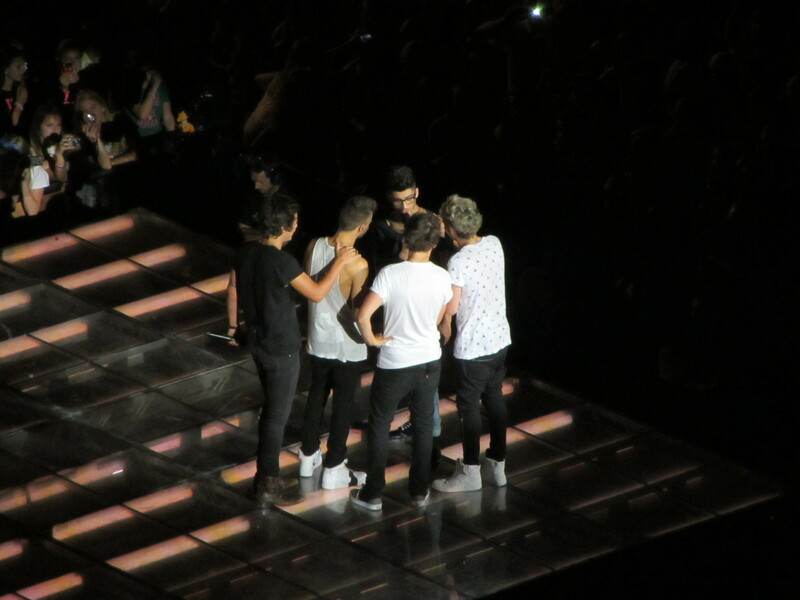 (There were a lot of Nouis moments during the show!) Then, after LWWY, Niall was in the middle of the stage (the others were sitting off to the side) thanking everyone for coming out. They said that Minneapolis was the loudest crowd they’d had and that it was truly their favourite show so far, they also said they don’t ever say that, but I think they’re making it up! 😛 They said they only had one song left, and that it was nice that no one was leaving because they usually see people leave at that point to try to beat the rush. He said they had one song left and one of the other boys called out “It’s Na Na Na!” and Niall thought that was hilarious and he was like “Yeah, one song left, and it’s Stole My Heart!” But, obviously that wasn’t it. Before they sang it, Niall was like “For any parents out in the crowd who didn’t know the last 21 songs, you’ll know this one, it’s What Makes You Beautiful.” and then the entire arena erupted with screams. I’ve never been to anything louder than a One Direction concert, honestly. 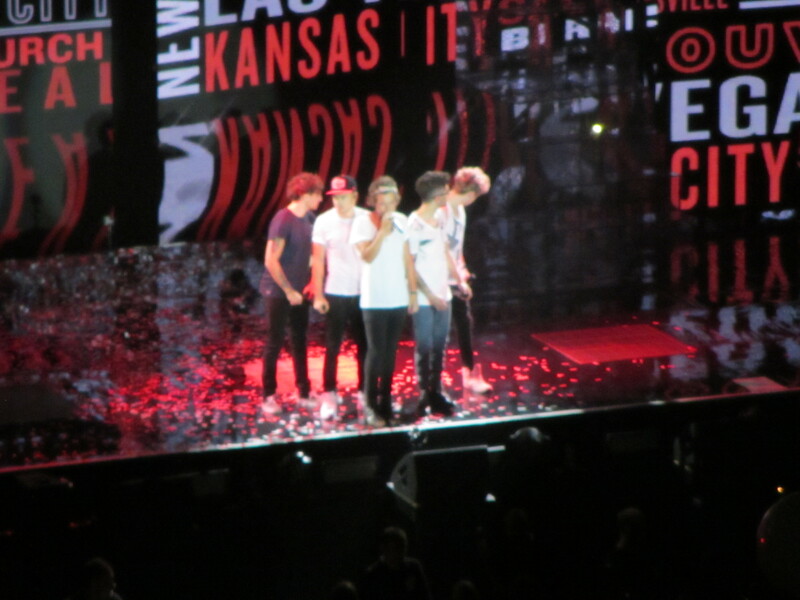 They sang WMYB with a ton of energy and confetti and their signature goofiness and dancing around the stage. I’m pretty sure Niall was the last one off the stage because he was still there when the others were gone, and then he just zipped down into this trapdoor on the stage. The band kept playing and then the lights came on and it was over. Unbeliveably fun and completely worth the year-long wait! The boys put on such a fun show and even though none of it’s choreographed, it’s almost better that way because it seems like they’re just having fun along with everyone who’s there to see them. Absolutely love them, Katie and I were gushing the entire car ride back to my hotel. ← Where You Are… Complete!